Back in the days I watched lot’s of cartoons. Teenage years I was drawing many sheets from the comic books, later on I started to draw caricature pictures about my surroundings. This was also the time when I lost my passion to the art and sketching. I’ve got it back in time but several years it took time. 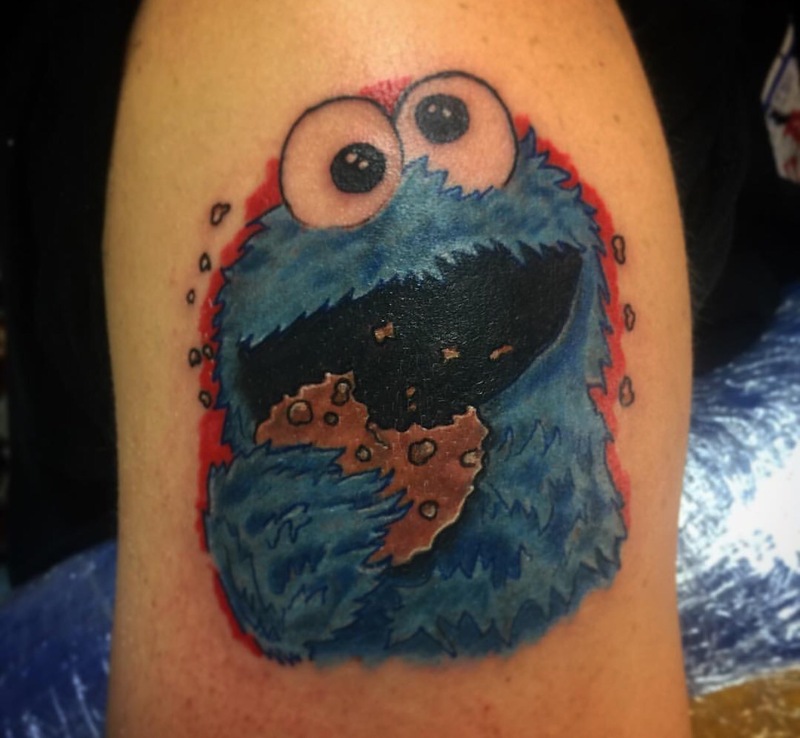 One my dear friend from Catalonia told me, that Cookie Monster was one of those joyful moments of his childhood. Next logical step as an adult is of course taking tattoo to your shoulder.. Really easy to understand, been there done that! This spectacular piece I’ve started with very accurate stencil, I marked all the black spots and outlines. Normally I would started by making the outlines but this time was different. My mentor always says about shading techniques and going from grey to black. Huge change for my shading technique, because I’ve done it always from black to grey. Maybe the reason for all this is this caricature drawing history of me. I have noticed that strong lines and shades what I use in those, works so much better with old school pictures. In the beginning I marked all the black spots with grey wash, using 13MAGNUM Shader and around 5% ink/water mixture. Next I changed needles and machine to the 7ROUND LINER and made all those outlines. In this point I already had a problem with stencil rub off. Hardest thing was to stay in those outlines. Coloring was also a hand full, but because l the dark spots were marked it was easier to apply. Four different kind shades of blue and it’s finish. In those really tight spots I were using 7FLAT Shader and 9ROUND Shader. Very Interesting and tough piece to do, and he took it well..
I’m really happy with this piece and saw it healed just few days ago. Intenze colors were used again. Definitely going to use this technique on my future work. Next time, more work.. thanks for your time. This entry was posted in Tattoo, Tattoos and tagged Tattoos. Bookmark the permalink. ← Making of few tattoos..